Those of you who read my post on the Tapas Trail will have seen that this was served as part of the dish in Bodega. As I’m not a huge lover of seafood, I’m pretty nervous of cooking it. I have been trying to challenge myself a bit more lately and so I thought I’d have a go at replicating this dish. 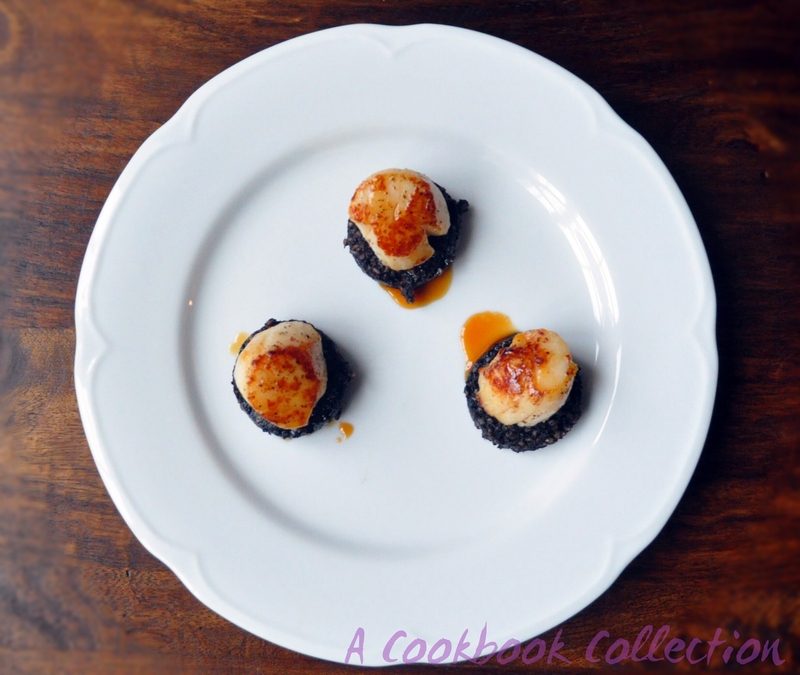 Once you are comfortable cooking scallops it is a very simple and impressive starter to make. It is also more filling than you might think. If you want to watch a video on cooking scallops, this one from Natalie Coleman is a good visual aid and explains it better than I can. I love Natalie, she is probably my favourite Masterchef winner ever. Using this method meant the scallops were nicely caramelised and cooked through but still very soft and juicy. There’s nothing worse than rubbery scallops! I haven’t really given exact measurements, as how much you need of everything depends on the size of the scallops you use. 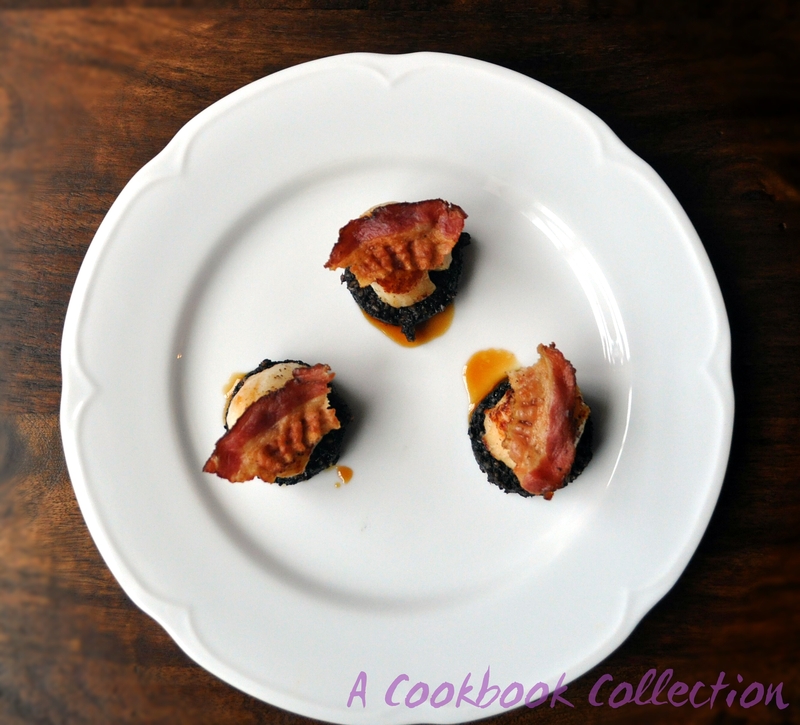 You do not want to lose the flavour of the scallops in the middle of the pudding and bacon. I cut this pudding to 5mm but I could have gone even thinner. I always use Clonakilty Black Pudding and it has a great strong flavour. Lastly, I have used Highbank Orchard Syrup. This is my favourite recent discovery. After hearing of it on the Tapas Trail it seemed to pop up everywhere on my Instagram feed. Basically it is an apple syrup that can be used in place of honey or maple syrup and if you can get a hold of it you won’t regret it. If you can’t get it, make a simple syrup by reducing apple juice and sugar. And no, I haven’t been paid to promote this! I cook the pudding and bacon first as they can be kept warm, but once you cook the scallops you want to serve this immediately. Grill or fry the pudding and bacon until the pudding is cooked through and the bacon is crispy. Set to one side and cover with foil to keep warm or put it into a low oven. Prepare your scallops by removing any membrane from the outside. You can keep the roe on if you wish but I don’t. Dry them well on kitchen paper and season with a little salt and a nice bit of pepper. Heat the butter or oil in a large non stick frying pan over a medium-high heat. You want the pan to be hot before you put the scallops in and they should sizzle as soon as they hit the pan. The easiest way to manage cooking the scallops is to place them in the pan like the numbers on a clock so that you know the order to turn them in as they cook very quickly. So start by putting in the first scallop where the ’12’ would be and dot the rest of the scallops around the pan in a clockwise direction, evenly spaced out. If your pan is not large enough to take all the scallops comfortably, cook in batches. Overcrowding the pan will cause them to stew. Allow the scallops to sit there until they are nicely caramelised on the bottom, I gave it about 90 seconds. The time needed depends on the thickness of the scallop – mine were not very big so if you have very large ones, allow longer or you could cut them in half. Flip them over starting with the one in the ’12’ position and work clockwise to turn the rest. Allow about 30 seconds on the second side just to finish cooking them through. To plate them arrange the pudding on a plate, top with the scallops and a drizzle of the apple syrup. Snap the slices of bacon in half and put a piece on top of the scallops. Thanks Jacqui. They are surprisingly easy alright. I must get braver with fish now! Looks good! What’s black pudding? Thank you! Black pudding is like a blood sausage usually made using pigs blood mixed with grains and spices. A lot of people are put off when they hear what it is but it is very tasty. The link below is the one I use and it’s actually made with beef. They look great. 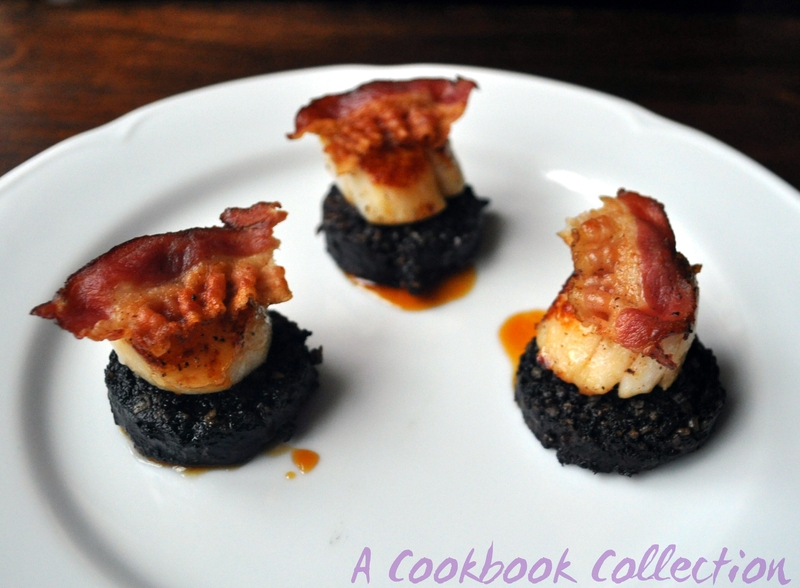 I must admit I can’t come to terms with black pudding, a throwback to trying my Grandads when I was little! Thanks Lisa. Black pudding really is one of those marmite ingredients alright! This sounds delicious, I’ll definitely be giving it a try soon.